This exciting news was announced live on TV during the 2014 CMT Music Awards by country music artist Justin Moore (whom we have had the honor of meeting and is a damn nice guy). 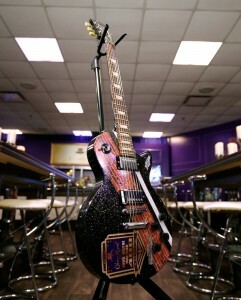 Walding even got a Gibson guitar. We’re a little jealous of the guitar. You’ll see why in a moment because we have pictures and we’re going to share them with you, along with all of the info about the July 27th race. How cool is that? 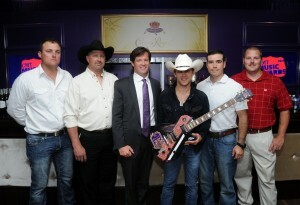 Here’s a shot of many of the other folks involved in Crown Royal’s terrific program, and then we’ll show you more pics of the guitar. It’s got bricks on it! Don’t you want a guitar with bricks on it? Here’s a quick clip of Justin Moore performing at the Indianapolis Motor Speedway last year. We were there. Crown Royal sent us. (That’s called full disclosure, folks.) It was fun. 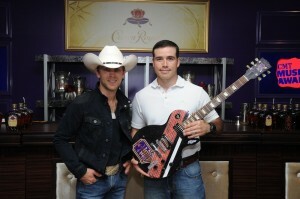 Last but certainly not least, here is one more photo of Justin Moore and John Wayne Walding looking extremely badass in front of an official Crown Royal vehicle. They should give these two a buddy movie. I’d watch that. 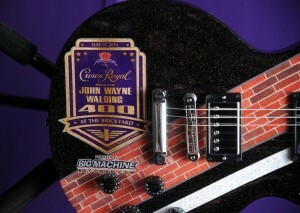 Now, without further ado, here is all the info you need to know about the Crown Royal Presents the John Wayne Walding 400 at the Brickyard Powered by BigMachineRecords.com. Crown Royal Canadian whisky is the number one selling Canadian whisky brand in the US by value and has a tradition as long and distinctive as its taste. Specially blended to commemorate a grand tour of Canada made by King George VI and Queen Elizabeth of Great Britain in 1939, Crown Royal Canadian whisky’s smooth, elegant style reflects its aristocratic origins and is considered the epitome of Canadian whisky. For more information visit www.crownroyal.com. Crown Royal encourages all consumers to please drink responsibly. Diageo (Dee-AH-Gee-O) is the world’s leading premium drinks business with an outstanding collection of beverage alcohol brands across spirits, beer and wine. These brands include Johnnie Walker, Crown Royal, J?B, Windsor, Buchanan’s and Bushmills whiskies, Smirnoff, Cîroc and Ketel One vodkas, Baileys, Captain Morgan, Tanqueray, Guinness, Beaulieu Vineyard and Sterling Vineyards Wines. At the helm of the independent Big Machine Label Group is industry veteran Scott Borchetta, who serves as President and CEO. The conglomerate encompasses Big Machine Records (founded in 2005), The Valory Music Co. (founded in 2007), Republic Nashville (a partnership with Republic Records founded in 2009 with Jimmy Harnen serving as President) and Dot Records (a joint venture with Republic Records founded in 2014 under the leadership of General Manager Chris Stacey). The Big Machine Label Group’s current artist roster includes Multi-Platinum superstars Taylor Swift, Rascal Flatts, Tim McGraw and Reba; Platinum sensations The Band Perry and Florida Georgia Line; Legendary group The Mavericks; Gold-selling artists Brantley Gilbert and Justin Moore; Chart-topping act Eli Young Band as well as Hot newcomers Thomas Rhett, Cassadee Pope, RaeLynn, Laura Bell Bundy, The Cadillac Three and Danielle Bradbery, in addition to a Country tribute to well-known rockers Motley Crue and soundtracks for ABC’s hit drama “NASHVILLE.” BMLG artists have received multiple GRAMMY, CMA, ACM, American Music Awards, CMT Music Awards, Teen Choice Awards, MTV Video Music Award and People’s Choice Award accolades as well as Brit Award and JUNO Award nominations. In 2012 BMLG rejuvenated its publishing arm with Big Machine Music, which has created a joint venture with Lukasz “Dr. Luke” Gottwald’s Prescription Songs, allowing the two companies to co-publish songwriters and artists whose unique talents translate across genres. Big Machine was also the first-ever label to align with terrestrial radio for performance royalty rights. The label group has also forayed into the racing world, sponsoring the Brickyard 400 as well as back-to-back Indy500 drivers. The Indianapolis Motor Speedway has been the worldwide leader in motorsports entertainment since it opened in 1909. The facility has hosted the Indianapolis 500, the world’s largest single-day annual sporting event, since 1911 and also is the site of the Crown Royal Presents the “Your Hero’s Name Here” 400 at the Brickyard and the Red Bull Indianapolis GP. The NASCAR Nationwide Series and TUDOR United SportsCar Championship also will race for the third consecutive year at IMS in 2014. IMS is the world’s largest spectator sporting facility and is the only venue to stage annual races in the Verizon IndyCar Series, NASCAR Sprint Cup Series, NASCAR Nationwide Series, TUDOR United SportsCar Championship and MotoGP.